Best Season : The Tourist seasons of Ajanta and Ellora extends almost through out the year. Entry Fee : Indians Rs.10, Adults Foreigners US$ 10 free on Friday, A light pass of Rs.5 is necessary if you want the guide to turn on the lights. Video Camera Rs 25. Flash photography is strictly forbidden in this caves. Ajanta caves, designated as a UNESCO World Heritage site, holds masterpieces of Buddhist religious art, considered the finest examples of architecture. These historical manmade caves containing paintings on the walls and ceilings primarily depict the life of the Buddha before his enlightenment. The caves are located 100km northeast of Aurangabad, the nearest railhead being 55 km north at Jalgaon city of Maharashtra, India. The golden age of Buddhism began with the conversion of Emperor Ashoka into the religion in the 3rd century BC. Around 2nd century AD Buddhism split into two sects, Hinayana and Mahayana. The caves at Ajanta which cover both the systems, belong to two distinct phases of Buddhist rock-cut architecture, separated from each other by an interval of about four centuries. They were created out of hard rock with the barest of implements and served as monastic retreats for Buddhist monks, scholars, pupils and artists. The caves which were found to be continu ously used or lived in from 200 BC to about AD650 were rediscovered in 1819, by a group of British soldiers who stumbled upon these cultural treasures overrun by foliage, many of them clogged with debris. The 30 rock-cut caves with incomparable beauty, are cut into the steep face of a horseshoe-shaped hillside, silent but for the birdsong from the nearby Waghore River. The caves, some of them unfinished, are of two basic designs called 'Chaitya grihas' and 'Viharas'. Five of the caves (9,10, 26,29) are Chaityas (Buddhist cathedrals) while the other 25 are Viharas (monasteries). Chaitya grihas were halls of worship - large, rectangular chambers separated by rows of pillars into a central nave, surrounded by aisles on three sides, for circumambulation during prayer, with a sanctuary opposite the entrance. The Chaityas are decorated with sculptures and murals depicting the many incarnations of Buddha. Viharas or monasteries are rectangular shaped halls with series of small cells attached on two sides for the dwelling of monks. Among them, the earlier group belong to the Hinayana sect (2nd century B.C) and the latter group, to the Mahayana sect (A.D. 450 to 650). Many of the caves are dark inside and without a light paintings are hard to see. A lighting ticket has to be purchased on production of which the cave guards turn on the lights for you to see the paintings. Many of the paintings still glow in their original colours. The outer walls are covered with sculptures. The art depicts the elegant timber-built interiors of spacious palaces, halls, peopled by be- jewelled princess and princesses, retinues of attendants, mendicants and market places, celestial musicians and fur capped foreign emissaries on unknown missions. War-horses in colourful trappings, monkeys, peacocks and elephants and host of other images dominate the world of these unknown artists. Ajanta paintings are more correctly tempera, since they are painted on a dry surface. The paintings were executed after the rock walls were coated with a 1cm thick layer of clay and cow dung mixed with rice husks. A final coat of lime was applied to produce the finished surface on which the artist painted. These beautiful paintings have survived time and still make the atmosphere very vibrant and alive. The contours of the figures leave the visitor spell bound. Cave 1, the most beautifully decorated of the Ajanta caves, has some of the best preserved paintings. Magnificent array of colours, hairstyles, poses and costumes can be seen in the paintings. A verandah surrounded by several smaller cells and porches at either end, has three doorways leading into a pillared hall which has sculptures and narrative murals. The paintings of women, jataka scenes etc cover the hall walls. Paintings of Bodhisattvas with headdresses flank the antechamber doorway in the middle of the rear wall. The most popular among them is of Bodhisattva Avalokitesvara and Bodhisattva Padmapani in a pose of spiritual detachment, (one with lotus in his hand). These paintings reveal the true mastery of the artist and a relief carving of four deer's is also a wonder of this cave. Bodhisattva Vajrapani with a crown jewels on his head is another well known portrait of cave 1. Cave 2 is a late 'Mahayana' vihara remarkable for its ceiling decorations and murals narrating the birth of Buddha. The painted ceiling is decorated with murals as well as geometric and floral patterns. The mural scenes include a number of 'jatakas' and events surrounding the Buddha's birth such as a scene of Buddha's mother standing in the garden at Lumbini showing his birth, Gautama being held by his mother and taking his first steps, and '1000's of Buddha's', a large painting which illustrates the miracle when the Buddha multiplied himself to confuse a heretic. Cave 3 was never completed. Cave 4 is the largest monastery at Ajanta and is supported by 28 pillars. The verandah has eight octagonal columns, with cells at both ends. Although it was never completed, the cave has some fine sculptures, including scenes of people fleeing from the eight great dangers to the protection of the Buddha's disciple Avalokitesvara and depicts a man and woman fleeing from a mad elephant, a man giving up his resistance to a tempting woman etc. An inscription records that Buddha image in Cave 4 was the gift of some Abhayanandi who hailed from Mathura. There are large unfinished Buddha images in the cave. Cave 5 is also unfinished but the door was completed. The door points to an early date with heavy, curvilinear figures and low-relief 'makaras'. Cave 6 is the only two storey vihara at Ajanta. The lower level is a pillar hall, to support the upper level; inside is a seated Buddha image with his feet squat on the base with an intricately carved door to the shrine. Stairs from the lower level lead upstairs to a hall surrounded by cells with fine paintings on the doorways. Although incomplete, the cave provides an insight to the importance of shrines. Cave 7 has a large porch. It has an unusual design of verandah with two porches each supported by heavy sculptured octagonal Elephanta-type columns which leads directly to the four cells and the elaborate shrine. The central shrine houses the usual arrangement of Buddha and Bodhisattvas. Cave 8 is a small vihara. Cave 9 a chaitya, dates from the Hinayana period. It is a large liturgical hall, with a monolithic stone stupa carved from the living rock. The vaulted room was once wooden ribbed and leads back from a huge 3.4m arched chaitya sun windows which throws light on the stupa at the rear. Two Buddha figures from the Mahayana period on either side of the entrance are painted. Cave 10 is said to be the oldest cave dating from 200 BC filled with Buddha's and dominated by an enormous stupa. It is a chaitya hall with an apsidal-ended interior. There are paintings from the Hinayana and Mahyana periods. The 'Shadanta jataka', (1st century BC) a legend about the Buddha, is depicted on the wall in a continuous panel. The indentations in the floor near the left-hand wall were used for mixing paint pigments. Traces of later Buddha figures are seen on the columns and aisle ceilings. The cave also preserves a number of inscriptions. Cave 11 has a verandah and roof painted with birds and animals, flowers, a hall supported by four heavy pillars and a stone bench running along the right side. The high plinth and parapet of the exterior are decorated with railings. There are five cells and a shrine of a seated Buddha. The Buddha in shrine of cave 11 is one of the earliest images at Ajanta. The important fact about this Buddha is that, it is attached to a stupa. This indicates a compromise between stupa worship and image worship and shows the transition from the earlier Hinayana to the later Mahayana Buddhist phase of worship. Cave 12 and 13 are small viharas belonging to the earlier phase at Ajanta. Their facades have completely collapsed, exposing their interior square cells with rock-cut beds. The doorways in cave 12 have arched motifs connected by friezes of railing motifs. Cave 14 was planned on a grand scale, but was never finished and can be missed along with cave 15 which is a long hall with a Buddha carved out of the rock. Cave 16 is one of the largest and later monasteries at Ajanta. Some of the finest paintings can be seen here. The combined media of painting and sculpture adorn the dark interiors. There is a fine view of the river from here. Two welcoming elephants guard the entrance. The 'Teaching Buddha' is seated on a lion throne teaching the eight fold path. 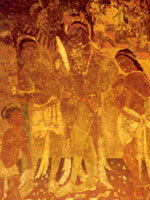 The most interesting feature of cave 16 is the painting of 'The dying princess', representing Sundari, the wife of Buddha's half brother, Nanda, who left her to become a monk on which an art critic commented, "For pathos and sentiment and unmistakable way of telling its story, this picture cannot be surpassed in the history of art". This is one of the finest paintings at Ajanta. Nanda features in several other paintings, including one of his conversion by the Buddha. Cave 17 has the finest as well as the largest number of murals at Ajanta. They include beautiful women flying overhead on the roof, while carved dwarfs support the pillars. On the left of the verandah of cave 17, is a row of amorous couples in varied styles of dress and coiffures above which is a row of seated eight Buddhas including Maitreya, the next Buddha to come under the respective Bodhi tree. One of Ajanta's best known images shows a princess, surrounded by attendants, applying make-up. In one, there is royal procession, while in another an amorous prince plies his lover with wine. In yet another panel the Buddha returns from his enlightenment to his own home to beg from his wife and astonished son. Other favorite paintings include the scene of a woman applying lipstick and of a princess performing sringar. The ceiling of the Cave 17 porch is very elaborate, and beautifully executed. Cave 18 is basically a cut-through to Cave 19 from Cave 17. It has a little of merit and can be missed. Cave 19 is one of the two Chaitya halls belonging to the later series with many paintings and sculptures. It is carved with pillars, a monolithic carved symbolic stupa and images of the Buddha which heralded the introduction of the Mahayana phase. There is a standing Buddha on the tall stupa. The stupa itself is crowned with an umbrella that nearly touches the room. This cave is amongst the best surviving examples of a rock cut Chaitya griha. Cave 20 is a small vihara and has rock-cut beams carved into the ceiling. The animals, fish-tailed figures, and lotuses are all reminders that this ceiling, like the others at the site, depicts a lotus-lake. An antechamber protrudes into the hall. The verandah columns and brackets are delicately carved. Cave 21 has several large viharas which remain unfinished and has a fallen verandah with flanking chapels. The walls have relief carvings. The porch carving is refined and nearly complete. Cave 23 is incomplete but the pillars are elaborate, with beautiful yakshi brackets. Cave 24 would have been the largest vihara at Ajanta if it had been completed but the doorway is beautifully carved. Cave 24 shows how they were constructed-long galleries were cut into the rock, and then the rock between them was broken through. Cave 26 is a large chaitya hall and two side viharas. The walls carved with scenes of the Buddha's life and miracles, including the temptations by Mara's daughters, but the most striking being a huge figure of 7m long figure of the 'reclining image of the Parinirvana (liberation) Buddha', about to enter Nirvana. Below are figures of his followers mourning his passing away and above are the celestial beings. But almost every trace of its paintings has disappeared. Cave 27 is virtually a vihara connected to the cave 26 chaitya. There is a great pond in a box canyon 200m upstream from the cave. These are the wonders of Ajanta. In the days of its glory, hundreds of monks lived and prayed and pondered on the meaning of life and death here. This isolated gorge and the marvels it contains are a tribute to the piety, vision, creativity and sheer determination of the men who chiselled these wonderful caves out of unyielding rock fifteen hundred years ago.